This is a very well presented 2 bed 1.5 bath townhouse on the popular Urbanisation of Valencia, Villamartin. It has a large lounge/dining area which leads into a well equipped kitchen. From the kitchen there is access to the utility room and then through to the back garden where you will find table, chairs, parasol & BBQ. There is a toilet off of the lounge and then stairs which lead up to 2 double bedrooms and a family bathroom with his & hers sink. 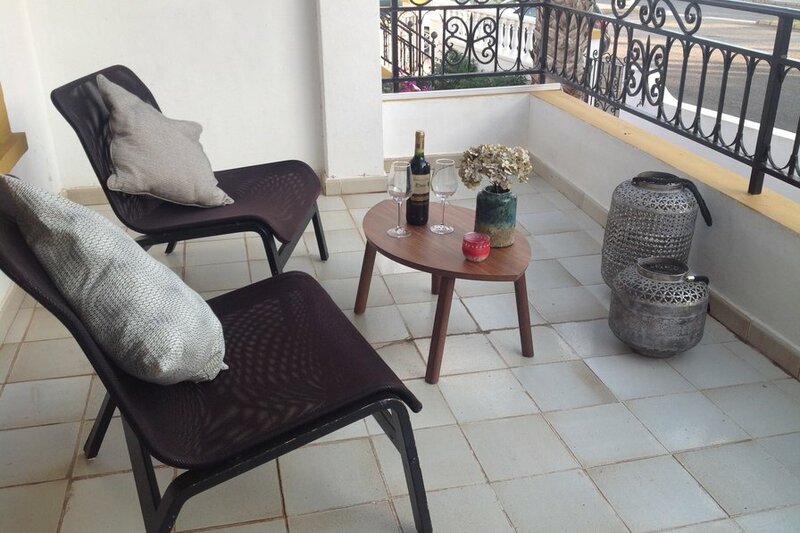 Up another level takes you to the roof terrace for private sunbathing. The apartment has air conditioning, UKTV, WIFI and also has 2 bikes for your use if you fancy sightseeing by bike. You are a 8 minute walk to Villamartin Golf Course & Plaza. You are also a 5 minute drive from La Zenia boulevard and La Zenia Beach. Villamartin is an upmarket area, and is in an excellent location being to home to three championship golf courses - Campoamor, Las Ramblas and Villamartin. Within a few minutes drive are the stunning blue flag beaches at La Zenia, Playa Flamenca, Cabo Roig & Campoamor with magnificent views over the sparkling blue Mediterranean and the white sand that is typical of the Costa Blanca. All of these beaches and all the other major beaches along this part of the Mediterranean coastline are regularly awarded the European Blue Flag which is your guarantee of high standards and facilities for the whole family. The Villamartin area also has very good local amenities, including a wide range of restaurants, bars, supermarkets, and banks etc. The impressive Villamartin Plaza contains numerous restaurants varying from Italian, English, German, Spanish, Mexican, Austrian, Chinese, and French cuisine to name but a few, and these serve food both indoors and outside in the summer months in the delightful courtyard. There is a small supermarket at the Villamartin Plaza which stocks all the essentials. Mercadona is a large supermarket just a few minutes drive away. Villamartin is a perfect base for a relaxing holiday for golfers, couples and families alike & a fantastic place for permanent living. Murcia San Javier airport is 20 minutes away & Alicante airport 45 minutes away. The nearest motorway junction is 5 minutes by car. Torrevieja with it's lovely marina, Blue flag beaches & everything you could possibly want & more is less than 15 minutes by car.